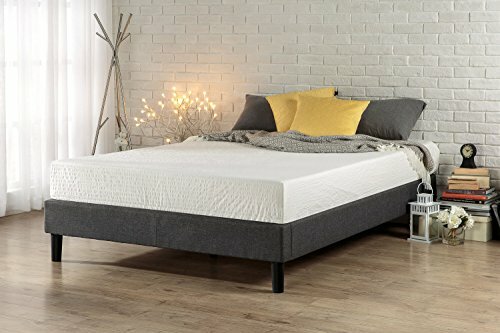 This sturdy Modern Studio Platforma Mattress Foundation is designed for strength and style. Perfect for higher profile mattresses or those preferring a modern style. 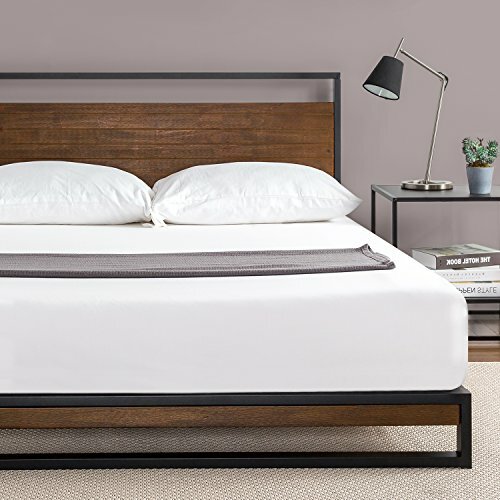 The extra strength steel framed mattress foundation by Zinus features wooden slats that provide strong support for your memory foam, latex, or spring mattress. 10 inches high and compatible with or without a box spring. Easy to assemble and arrives in a narrow box to make moving through hallways and upstairs easier. Another comfort innovation from Zinus. Pioneering comfort. Transform your bedroom with this Diamond Stitched Platform Bed Frame by Zinus. 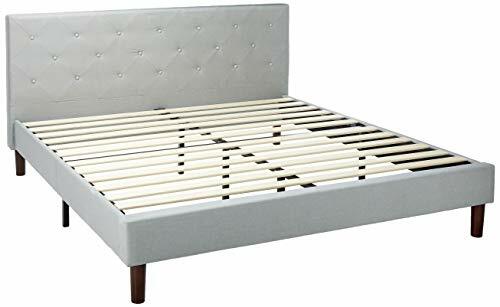 Classic styling and strong reliable wood slat support with less than 3 inch interval spacing for your spring, memory foam, latex, or hybrid mattress. Ships in one carton with the frame, legs and wooden slats conveniently located in the zippered compartment in the back of the headboard for easy assembly. No box spring needed. 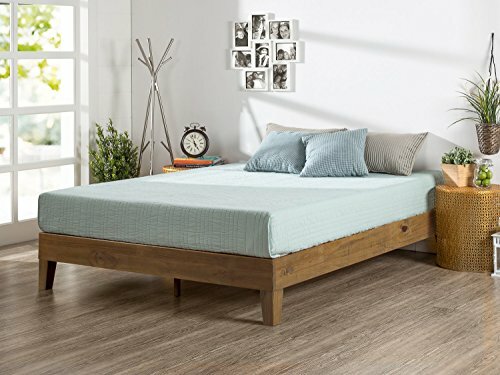 Featuring a classically styled headboard and low profile footboard frame this platform bed offers strong, reliable support for your mattress. Another comfort innovation from Zinus. The new Ironline Platform Bed by Zinus will instantly update any bedroom. 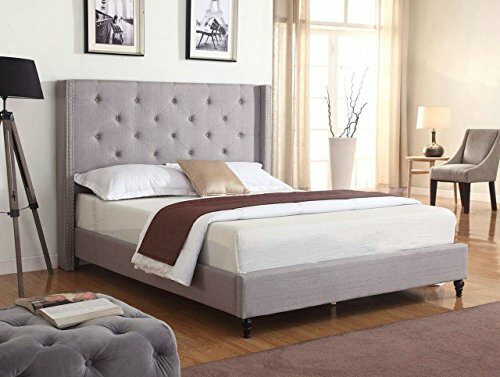 With the cherry finished pine wood headboard, sleek metal structure, and wood slats, this platform bed provides great support for your memory foam, latex, or spring mattress while looking great in your bedroom. Use with or without a Box Spring to personalize your mattress height, mattress sold separately. Another comfort innovation from Zinus. 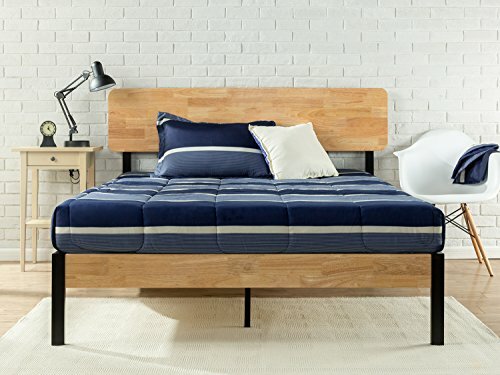 The steel framed Zinus Quick Lock Platform Bed Frame with Headboard features steel slats that provide strong support for your memory foam, hybrid, or spring mattress. This Platform Bed is 14 inches high with clearance under the frame for valuable under bed storage. Mattress not included. The Quick Lock 14 Inch Platform Bed with Headboard provides stylish and strong support for your mattress without the need for a box spring. Another comfort innovation from Zinus. Linen Platform Bed. High quality Linen construction. With Slats unlike anyone else who sells beds. All you need is a Mattress no bulky box spring to worry about. The Zinus Deluxe solid wood platform bed is beautifully simple and works well with any style of home d cor. The 5.75 inch frame and legs are made of solid rubber wood to support your memory foam, latex, or spring mattress. The Zinus solid wood platform bed is 12 inches high and designed for use with or without a box spring foundation. Stylish and strong support for your mattress at an affordable price. Another comfort innovation from Zinus. If you need more storage options in your bedroom without taking up more floor space, this ottoman bed is the answer! 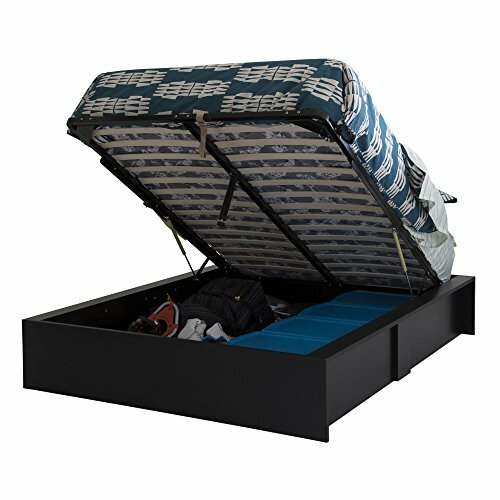 The bed s wooden slat frame lifts easily, providing access to an under-bed space big enough to store seasonal clothing, sports equipment and much, much more. The contemporary style and neutral finish blend smoothly with any color scheme, making the storage bed the perfect, practical addition to your bedroom or the guest room. Shop with confidence knowing that we proudly stand behind this Step One Ottoman Storage Bed with a full 1-year limited warranty. Mattress and accessories not included. Assembly is required we recommend 2 people to assemble, tools are not included. Ships in 3 heavy boxes - make sure to have a friend with you. This product s packaging has been tested and is certified to reduce the risk of damage during shipment. Can support a total weight of up to 500 lbs. Made in Canada with non-toxic laminated particleboard. Mechanism made in China with metal and wood. Clean with a soft dry cloth. South Shore Furniture's support team is available 7 days a week if you have any questions. CONTEMPORARY DESIGN: This sleek and modern ottoman bed features clean, elegant styling and neutral colors to complement any bedroom d cor. ECO-FRIENDLY: Bed frame is made in Canada with non-toxic laminated particleboard. Hydraulic bed mechanism is made in China from metal and wood. 1-YEAR LIMITED WARRANTY: Shop with confidence knowing that we proudly stand behind this platform bed with a 1-year limited warranty. Assembly is required.